Elton John tickets for his must-see farewell tour are on sale now! See classics like "Rocket Man" and "Your Song" live as he blows you away with his combined piano-playing and vocals. He is now touring North America and Europe in addition to his Las Vegas residency. Check out the Elton John tour schedule for a concert near you! He just released a new album in 2016 titled Wonderful Crazy Night, so his tour will surely include new songs as well as old hits. Elton John tour tickets are some of the hottest in the country, and you don't want to miss seeing a concert in person. One of the few Rock and Roll Hall of Famers to ever be knighted, Sir Elton Hercules John is one of the most successful musical artists in history. Since the early 1970's, the music of Elton John has been a part of our universal pop consciousness. John has more classics in his repertoire than some musicians have material, and Elton John tickets are some of the most highly desired concert tickets of all time. Elton John tickets always always sell out early. 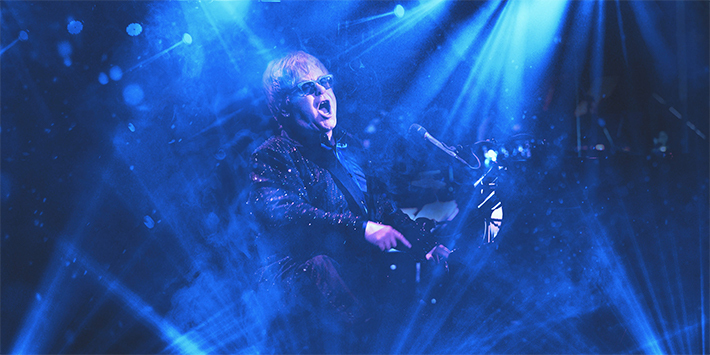 With a following as massive as his, the race is on to be among the first to secure those Elton John tickets and see the legendary pianist live in the flesh. The Elton John story is a tempestuous one, and this fact only serves to drive up the demand for Elton John tickets even further. Everyone wants a real, live glimpse of this artistic dynamo at work. Playing in the band Bluesology throughout the mid to late 1960's, his first international hits came in 1971 on his second album, a self-titled release, including "Your Song." Early hits like "Crocodile Rock," "Goodbye Yellow Brick Road," and "Saturday Night's Alright (for Fighting)" established Elton John as creative force to be reckoned with on both sides of the Atlantic. He went on to be one of the most successful recording artists of the seventies, with globally-successful singles including "Rocket Man," and, notably, "Candle In The Wind" (a song about Marilyn Monroe) and the equally well-known B-Side "Bennie And The Jets." His 1980s hits included "Nikita," "Sad Songs," and "I'm Still Standing," amongst others, most featuring his distinctive piano playing. In 1997, he updated the lyrics of "Candle In The Wind" for a special version mourning the death of Diana, Princess of Wales. And the barrage continued with quality material in multiple genres resulting in Grammys, an Academy Award, a Golden Globe and a Tony for his albums, film and theatre work. He has done top-grossing soundtrack work for major films and starred in a few himself. In 1971, he wrote original songs for the movie Friends. In 1975, he appeared as the Pinball Wizard in the movie version of the rock opera Tommy. Then, in 1994, he (along with Tim Rice) wrote the songs for the Walt Disney animated film The Lion King (John and Rice subsequently won a Best Original Song Oscar for "Can You Feel The Love Tonight"). In 1999, he wrote the score for The Muse, and a year later composed songs for another animated film, Dreamworks' The Road To El Dorado. His most recent movie song was "The Heart Of Every Girl" (the end title song from 2003's Mona Lisa Smile). With this kind of versatility it's no wonder that fans flock to the box office for Elton John tickets. In addition to his musical endeavors, Elton John is a major proponent of LGBT rights and AIDS activism. Elton continues to release new material to commercial success and tours extensively, despite being fitted with a pacemaker, and is in Vegas at Caesars Palace! Elton John and his "Million Dollar Piano" will be holding court at The Colosseum. As one of modern music's true pioneers, and an Elton John ticket is a ticket into the world of a musical maestro. Find Elton John tickets today, and relish this opportunity to see him do his unique thing on stage before your eyes.